Annual event that begins on North Charles St. and ends on East Pratt St.
Baltimore is located in central Maryland at the head of the tidal portion of the Patapsco River, an arm of the Chesapeake Bay, and is approximately 40 miles (64 km) northeast of Washington D.C. 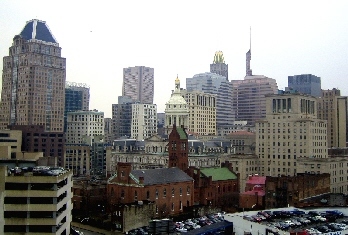 The Port of Baltimore at Locust Point was created in 1706 for the tobacco trade. The new passenger terminal, South Locust Point, is located right off the interstate and only a ten minute drive from the airport. The cruise terminal entrance opens at 10:00AM for departing passengers; however, do not arrive prior to the embarkation time on your ticket. Please have your ticket ready upon entering the Port of Baltimore, tickets must be shown at the cruise entrance gate and passenger building. Due to security restrictions, no one will be allowed in the passenger building without a valid cruise ticket. All visitors will be required to present valid picture identification at the security gate (e.g., state driver's license or official identification with photograph). All minors must be accompanied by parent or have authorization. Prices subject to change. $15.00 per day for passenger cars/$30.00 per day for recreational vehicles under 30 ft./$40.00 per day for buses and recreational vehicles over 30 ft. More information on parking. Rates subject to change by the Port Authority. Oversized vehicles will be charged per parking space. Handicap Parking available with proof of valid permit. Shuttle service available to/from the terminal/parking. Secured, on-site, outdoor parking - no advance reservations required. Full payment due upon entering the parking area - accepted forms of payment: U.S. Dollars; Traveler's Checks. Several local cab companies are available at the cruise terminal as soon as you step off the ship. Please note, only four (4) passengers are allowed per taxi, generally minivans are not available. Rate: $27.00 flat rate from Locust Point Cruise Ship Terminal to BWI Airport. The flat rate applies regardless of the number of passengers/parties that share a ride. No other charges may be added. Rates to all other destinations are calculated by meter. Try and time your visit for the 2:30pm feeding at the stingray tank and the 3:30 feeding at the reef tank. Grave site of Edgar Allen Poe. Built in 1849, President Street Station was an Underground Railroad site and played a pivotal roll in the Pratt Street Riot (first deaths of civil war.) Museum and gift shop are open daily, 7 days a week from 10AM - 5PM.